Top tip everyone. Using one raspberry Pi. 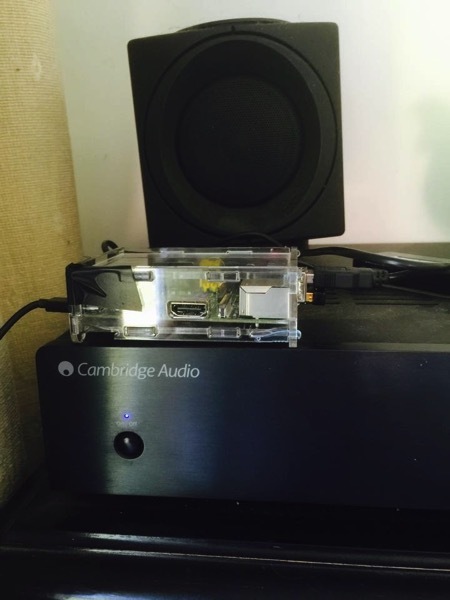 I installed a copy on the Pi of https://volumio.org Volumio turns a Raspberry Pi into a music streamer. 1) Once you’ve got Volumio installed, connect your Raspberry Pi, to your router using an ethernet cable. 4) Once you get to volumio setup screen you can give it the name (i.e the SSID) and password to your home wireless network. 5) You can also assign it a friendly name, i.e in my case Dining Room. 6) From the setup screens, you can shut-down your PI. 7) Once shutdown unplug from your router and go plug it into your amp or amplified speakers. So total setup took about 10 minutes. Sounds quality is superb (even using the headphone jack of the Pi). Next step is to mount the Pi inside the amp. so everything looks tidy.